“1939. Nazi Germany. THe country is holding its breath. Death has never been busier. Liesel, a nine-year-old girl, is living with a foster family on Himmel Street. Her parents have been taken away to a concentration camp. Liesel steals books. This is her story and the story of the inhabitants of her streets when the bombs begin to fall.”I actually read this book because I had to teach it; it was a pleasant surprise. I think Zusak does an absolutely brilliant job with this novel. 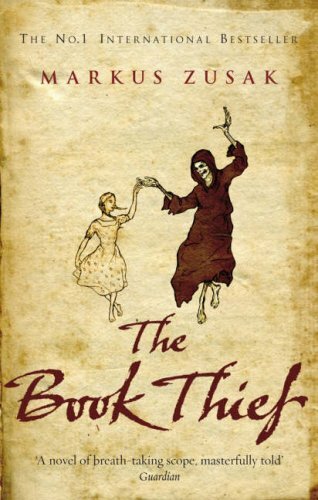 It has several things going for it; it was written by an Australian author, it is a WWII story focalised through the eyes of German characters, and most exquisite of all, it is narrated by Death. This book is imaginative, poetic, heart-breaking and breath-taking. I cried, hard. You may think I’m soft, but for me, that’s the mark of a good book . Highly recommended for ages 16 and up. It’s one of my favs. 5 stars.